This was so cool looking that I ordered one for my self ,or for my radio anyway. Good protective carry for your radio is tough to find these days and this is a good ,flexible system. Pretty cool, Carl. Very modular and it'll keep the knobs from getting sheared off in a box full of gear. 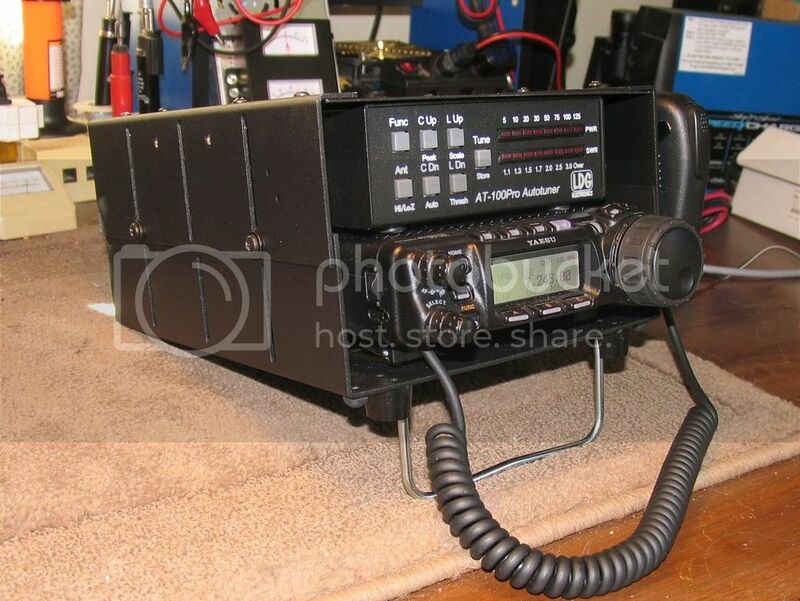 I can see using this for CBs and GMRS mobile units too. Yea,I thought about putting it in communications,but then just hope they read here too. I thought so much about this that I ordered one to put my FT857D in and I have little chance of going anywhere...but it is good carry/protection ans presentation for the radio and a tuner with the 'grow to fit' sides.It will be here Monday...so photos to follow. There is a different option for some radios,but I think not as protective. Almost posted that one; it's the route I've taken. The rails give decent side-bump protection for the faceplate knobs. Between the rails and a well-fitting bag, it stows pretty safely into a pack. The whole thing is well thought out and really well built. I'm not so enthusiastic about their all-in-one radio & battery rigs. The pre-sized battery compartment effectively marries your radio to that one battery standard. In the case of the 857, that's a 4.5 AH NiMH battery, which is already pretty antiquated. But the rails, those are good stuff. Picked mine up today and thought "Yeah that's Carl: a little ahead of the curve." I have lots of time on my hands and with Ham radio and internet as my means of viewing the world ,I do look and read a lot to keep from 'cabin fever' and losing my mind. This is why I experiment with antennas and such to keep up my,and others,interest. There are few things I can do to keep life interesting and few things I can do alone as I spend most of my time. 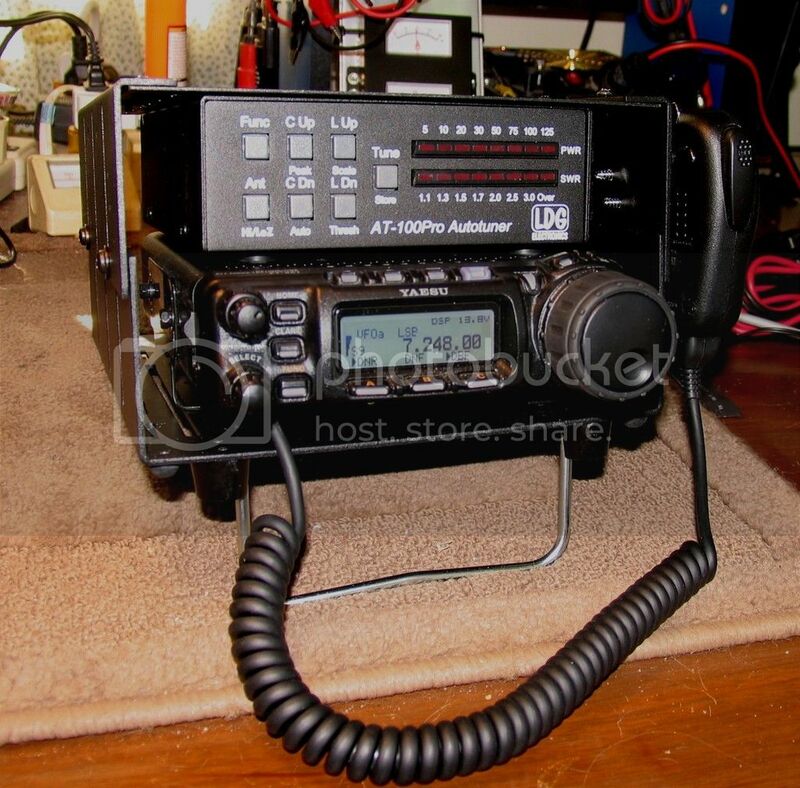 I just got my QST and tossed it in a chair till later,YOU brought the article to my attention even though I had already decided to add the protective carry case to my FT857D as I fear the knobs would not survive a case or backpack long and this "BOX" appears more protective than the 'ears' option of the other linked system. I just received my TRC-1 in the mail and I am impressed with the workmanship and the product finish is very nice. I just got off the phone with a very nice representative who made sure that I had the missing set of screws in the mail. with just the radio in it now. I will try to get photos in a day or so. Well,it is operational. 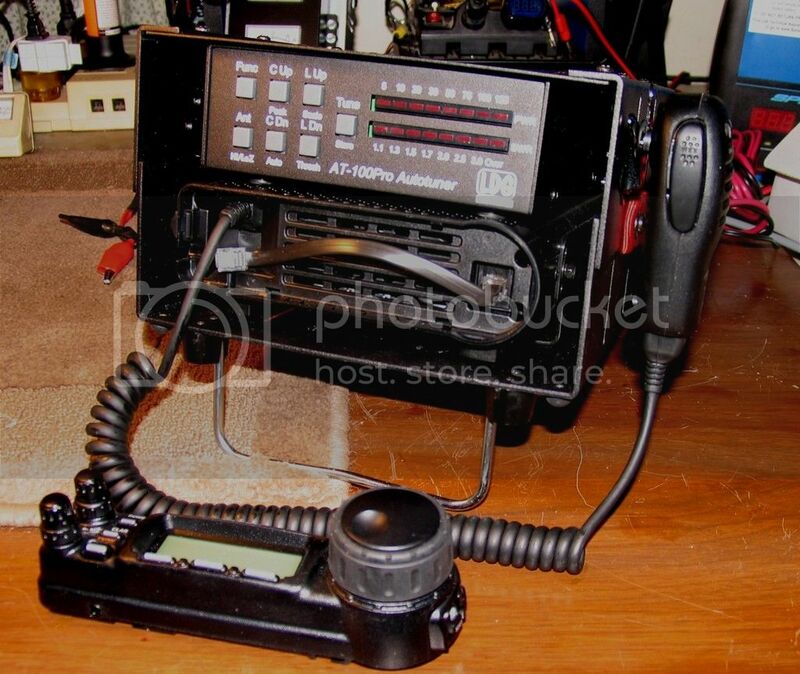 I promised photos..The Yaesu FT857D and LDG auto-tuner push the limit on what can fit the TRC-1 carrier. It makes for a nice and neat,well protected station. That really is a nice set-up. Thanks for posting the pics. Is there enough room to push the 857 back to give its faceplate some protection? Or does it hang out the back if you do that? Do they make one wide enough for an FT450D? Won't fit my Icom 7200 (9.5x 3 5/16 X11). I looked at these a few years ago. Still looking for something other than the harbor freight toolbox I'm using now. I sent this thread to them as they wanted feedback on their product. I get only the opportunity of aiding product refinement as I get nothing for letting them see our comments. The FT857 would fit within the TRC-1 box fully BUT then access to controls would be greatly restricted (note buttons on right side of main tuning knob) and what I needed was a compact station with travel option...the option being to simply remove the radio's face . 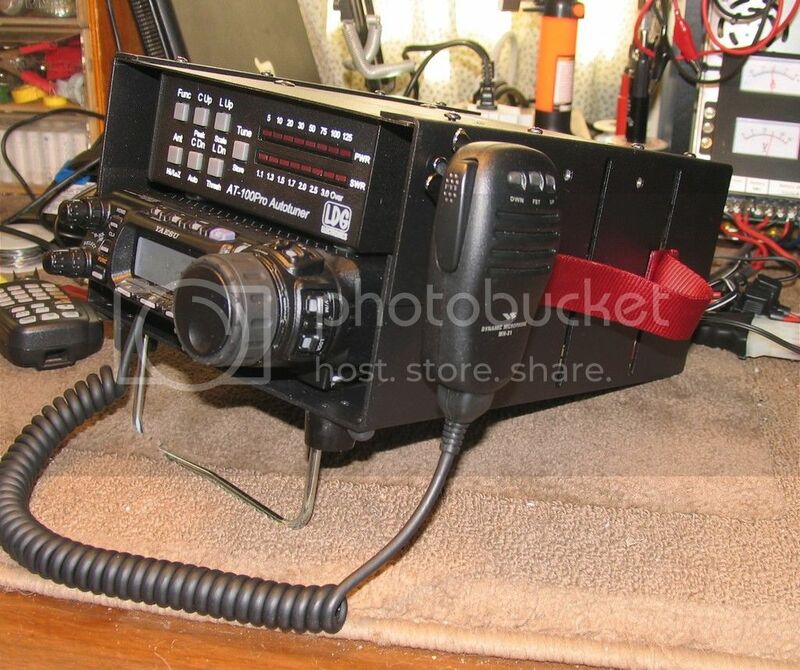 The TRC-1 is best suited for somewhat smaller VHF/UHF radios but I like to push the envelope and the 857 is on it's regular mounting bracket and has clearance for the heat removing fans to do their work and also to hear the top mounted speaker acceptably well. The LDG tuner came with no mounting option and the accessory straps for the TRC-1 would do fine,but I just ran 4 tech screws (they drill their own hole) into the top of the auto-tuner while being careful not to scratch the TRC-1 or damage the tuner electronics. It's mine and I do as I like with my stuff . As far as I understand,the TRC-1 is their one current option ,though I would bet they come up with a Ham's erector set with side channels and different top and bottom plate dimensions to fit most radios. I also own a FT450D and love the radios performance and looks. ... and what I needed was a compact station with travel option...the option being to simply remove the radio's face . Of course! Completely solves the problem of the faceplate taking the full weight of the radio, etc. on the knobs in a rough landing. Now that would be something I'd get. The 450 really is in need of a go-kit carrier frame like this. "Thanks for taking the time to send the info on the Survival Podcast. I have listened to Jack since he was podcasting while driving his Jetta TDI. I have occasionally dropped into the forums but not on regular basis. He is likely to respond to the Prepper need for a sturdy radio box as he is one of 'us" . Carl, this all sounds very promising. If I may make a suggestion to Larry, a carrier for the 450, maybe with some kind of face plate cover or maybe recess for protection, is something I could go for. Sounds like a good guy who's working up some good products. I am watching Mr Majestyk with Charles Bronson on Pryme this morning,I don't remember ever seeing it ,good movie.